The highly popular Marco Polo German Bierfest was honoured at the Marketing Events Awards organised by Marketing Magazine. On 19 July 2018, Marco Polo Hongkong Hotel took home the silver award for “Best Event Team” at the Marketing Events Awards 2018 ceremony. Celebrating its 27th anniversary this year, the Marco Polo German Bierfest 2018 will run for 23 consecutive nights from 19 October until 10 November 2018, bringing über fun to guests by the award-winning event team. 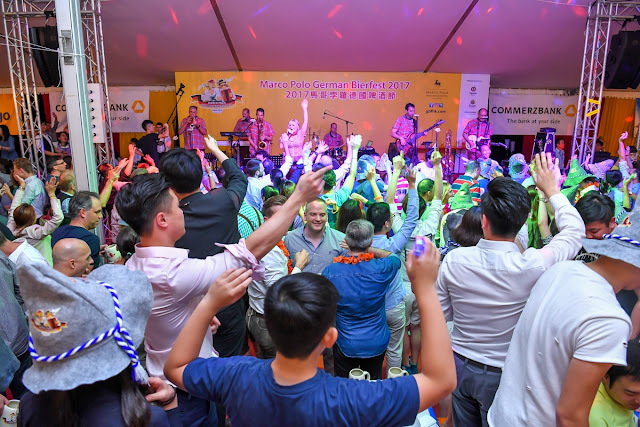 Since its inception in 1992, the Marco Polo German Bierfest has evolved to become one of Hong Kong’s annual signature events. The largest event of its kind in Asia is celebrated against the breathtaking backdrop of Victoria Harbour at Marco Polo Hongkong Hotel. The party spirit comes alive nightly with Die Notenhobler band from Germany playing folk and oompah tunes. As the evening’s energy hits high gear, the stage hosts joyful dancing and drinking games. One of the annual highlights is the Alphorn-blowing Challenge, where members of the audience compete onstage in showcasing their lung power to create original mountain music from the three-metre Alphorn. Authentic Bavarian dishes are freshly prepared under the watchful eye of Marco Polo Hongkong Hotel’s Executive Chef Rolf Jaeggi, whose German heritage guarantees the best crispy pork knuckles in Hong Kong. Marketing Magazine is Asia’s largest publisher of marketing and advertising news that is read by the region’s most influential and respected marketing professionals. The annual awards ceremony organised by the publication highlights the most creative and original campaigns and events across a wide range of industries in Hong Kong. The awards are judged by senior marketers across North Asia and Marketing Magazine’s editorial board.